George (“Check” or “Taff”) Checketts volunteered for the RAF at age 20 on 4 September 1939, the day after Chamberlain’s sombre declaration of war. by July 1940, George had qualified as a Sgt WOp/AG Grade II. By late 1940, he had 200 hours as a WOp/AG under his belt. George crewed up with Sgt Pilot Frank Baker and Sgt Observer Bob Hay in 82 Squadron in the UK, completing four operations. 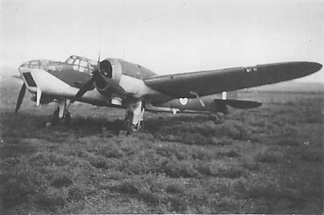 In late November, together they undertook a Blenheim Delivery Flight, ferrying new Mark IV T2179 out to Egypt. The first leg, Thorney Island to Malta, was a monster and a fair feat of navigation. Taking off at 0130hrs they flew for 4:45hrs through the night and on into the daylight to find themselves, owing to poor winds, in sight of Bizerta. With a 50 gallon overload tank in the bomb-bay, their reserves were sufficient however to get away with the added 50 miles dog-leg, to arrive at Malta (Luqa) at 1100hrs local time after a total flight of 8:30hrs over some 1330 miles. After that, the 6:30hrs daylight leg to Abu Sueir must have seemed a doddle. These two dangerous passages each counted towards their tours of operations. 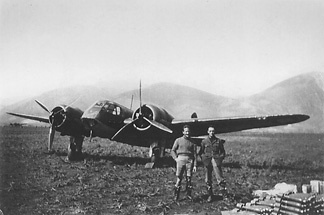 Posted to RAF ME but kicking their heels, the three volunteered as a crew for Greece and thus came to join 211 Squadron on 23 January 1941 at Menidi. In all, 10 aircrew were posted in that day, a spare pilot and three complete crews. 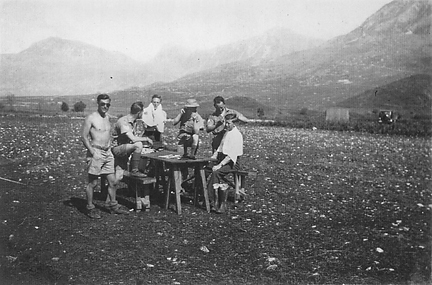 Over the next three months they saw plenty of action with 211 Squadron, at Menidi and at Paramythia. Evacuated from Greece on 21 April 1941, George had by then recorded a total of 12 operations and 243 flying hours. Still with his crewmates Baker and Hay, George Checketts subsequently served in 113 Squadron in action in the Western Desert, before a period of rest back with 211 Squadron operating as 72 OTU. Remaining with the OTU on its move to Kenya, his service was recognised in November 1942 with advancement to Flight Sergeant as a Wop/AG Grade I. By May 1943 (and still as a crew) it was time to leave old associations and return to operational duties with No 8 Squadron at Aden, where he advanced to Warrant Officer. 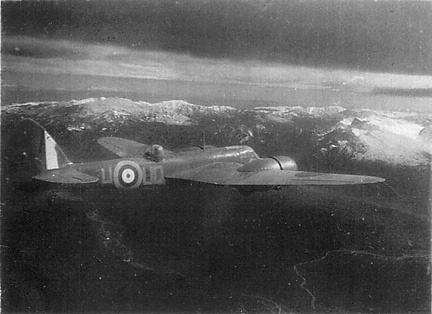 George later moved to the Aden Communications Squadron (which, as late as 1944, still rejoiced in the possession of Vickers Vincents among their richly assorted equipment). Then in November 1944, his fistful of sparks produced a well-earned reward: return to England and re-qualification as a Wireless Operator Mechanic (Ground) through No I Radio School at the RAF holy of holies, Cranwell. A posting to 547 Squadron at Leuchars on anti-submarine patrol followed, but soon he was relieved, posted as an Instructor to 10 Radio School Carew Cheriton. George left the RAF in October 1945. In civilian life, George Checketts was a lively spirit, who in his own quiet way contributed much to recording the history of No 211 Squadron RAF and of 113 Squadron too. Over the years, he kept up a very lively interest in the history and men of his old Squadron and in the Bristol Blenheim as an aircraft. His memories of Blenheim service were published in articles in Flypast in April & May 2000, as Taff's Air War. George kept in touch with me on 211 Squadron matters by email through son-in-law Chris Millard, and it was always a pleasure to hear from him. He was always on the look-out for old comrades and as a member of the Blenheim Society, George's abiding affection for the doughty Blenheim kept him active to the end. Thus it was that he took part in the Blenheim Society jaunt to Malta for the 60th Anniversary Commemorations of the end of World War II. Sadly, he missed the celebrations: taken ill on the outward flight, he returned to the UK and hospital, where he passed away peacefully with his family in attendance on Monday 17 October 2005. Bob Hay died in September 2003. Back in 2001, George kindly sent these fine pictures to Adrian Fryatt, recording his service in Greece with the Squadron. At last a Mark IV! But not for 211. Another named Mark I, on the ground at Paramythia. An evocative if rather soft shot, the name in this case cannot quite be made out but on George’s own recall, The Saint (L8449), later lost on the Easter Sunday raid. To the left, distant rear, another Blenheim. Front right, a 40lb and 20lb bomb dump. The pressure on the Squadron at Paramythia can be grasped from a glance at the entries George recorded in his Air Gunner’s Flying Log Book. From 22 February to 14 April 1941, he flew as W/Op/AG in no less than nine different Blenheim Is: L1388, L1434, L1496, L1538, L8466, L8513, L8533, L8541 and L8664; mostly to his regular crew Sgt Frank Baker (Pilot) and Sgt Bob Hay (Observer); but also with F/Lt Godfrey, P/O Thompson and Sgt Marshall. Shorts, sunnies and a short back-and-sides. But no sand. Bob presumably Bob Hay, their Observer. Peggy presumably Sgt “Peggy” James Benjamin Thomas O’Neill 746861, one of the Easter Sunday missing. To the right rear, a tent and a vehicle. Fascinating shot. 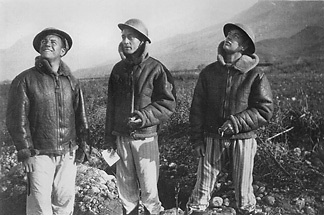 The two pilots and WOp/AG wear flying jackets, flying boots, tin hats and pyjamas, with cigarettes and rueful grins as they gaze skywards, standing alongside a slit--trench laboriously dug in the limestony ground. Bespeaks no immediate danger, so maybe the aftermath of one of the RA raids on the airfield or, just perhaps (being so well set-up a shot), a reconstruction. U-Uncle very close up—a really beautiful shot. Damned cold for the gunner. Original large fin flash and roundel, and apparently European pattern camouflage. Codes most probably in grey. G Checketts Taff's Air War (Flypast April, May 2000).